Israel’s military toughness is attractive for many Chinese, but its foreign policy stance isn’t feasible for Beijing. Many Chinese have mentioned on numerous occasions that, on issues involving military competition, China can use Israel as a model. Even Chinese military officials have repeatedly expressed similar views. For example, General Liu Yazhou, political commissar of China’s National Defense University, has publicly praised the Israeli Air Force. General Liu has studied much on the history of the Israeli wars. He wrote in the book God of War over the Sky: “If we say that the air force is the sword of Israel, then Israel is a consummate and superb fencer.” When General Liu led a delegation to Israel in September 2011, he talked about cooperation with Israelis to learn from Israel’s advanced experience. Israel and China have common interests, and military cooperation between the two countries is steadily advancing. Israel and China continue to learn from each other in the military sphere, as we have seen the in the past two years. For example, on August 13, 2012, Chinese naval vessels visited Israel for the first time and participated in joint military exercises. Earlier, the two countries cooperated on anti-terrorism missions, as border police from Israel conducted a large-scale exercise in Beijing, training 53 members of Chinese paramilitary forces. Israeli Defense Minister Ehud Barak paid a visit to China in the summer of 2011, and Israeli Chief of Staff Benny Gantz visited China in 2012, part of an exchange of visits with General Chen Bingde, Chief of General Staff of the People’s Liberation Army. In my opinion, on the macro-level, the Chinese military can indeed learn from Israel’s realizations about and methods for homeland defense. But when it comes to specific issues, Israel’s experience may not actually be able to contribute much in terms of thawing China’s peripheral security environment. To start, Israel’s national defense is offensive, and uses “preemptive strikes” as an important factor in its military strategy. This does not mesh with China’s long-standing education on military conflict and contradicts the concept of peaceful diplomacy repeatedly stressed by the Chinese leaders. Israel’s total land area is only a bit larger than Beijing. Further, Israel has had wars with all its neighbors, and its relations with these neighbors have been tense due to territorial disputes. Israel not only lacks strategic depth, but also faces a real sense of geopolitical insecurity. This is an important reason for the country to push its defensive front beyond its borders, including offshore and into foreign territory. China’s peripheral security situation has some similarities to Israel, in that China has had fought wars with a number of neighboring countries and currently has territorial disputes with neighbors. As a result, the Chinese military established the ADIZ to push China’s defensive front offshore and extend a strategic buffer space, which is consistent with Israeli defense concepts. However, when looking at specific and practical operations, China’s defense policy varies greatly from that of Israel. China adheres to the defense policy of “making preparations for military conflict” and thus lacks Israel’s “pre-emptive strike” power. Besides, taking into account the complex political relationships in the region as well as the current environment for China’s development, China would find it very difficult to “restrain” Japan as Dai ​​Xu suggested. Israel and its opponents in the Middle East rarely interact. Many of these countries don’t even have diplomatic relations with Israel. In a practical sense, this gives Israel more freedom to act. In contrast, China and its neighbors have diplomatic relationships, so China’s political and military actions are undoubtedly restricted by various treaties and agreements. Israel only has diplomatic relations with two neighbors, Jordan and Egypt. Israel hasn’t established diplomatic relations with Syria, Saudi Arabia, UAE, Qatar, Iraq or the other major Arabian powers, much less Iran. These relationships are marked by long-standing hostility. For example, Israel often threatens air strikes on Iran, which is an obvious expression of Israel’s attention to security. In retaining the freedom to make these threats, Israel “benefits” from a lack of diplomatic relations between Iran. China, meanwhile, has diplomatic relations with Japan and the United States. Not only that, but these two countries are keys to China’s development of regional and international diplomatic relations. The basic policy of China’s diplomacy is that “major powers are key; neighboring countries are primary.” The United States and Japan are both major powers and neighboring countries. Whether in government or the military, Chinese leaders first have to consider this overall foreign policy trend before making other logical judgments and developing policy aims. This situation is fundamentally different from Israel’s security dilemma. 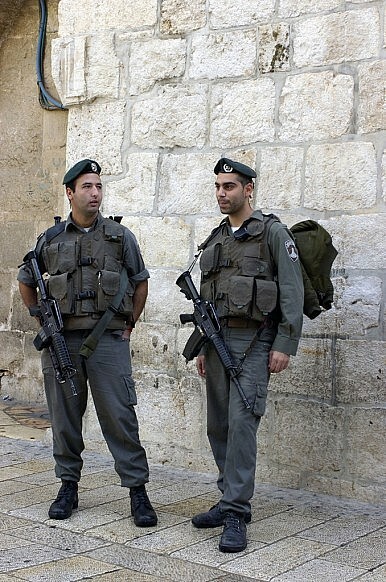 Additionally, many of Israel’s military behaviors derived from long-term military conflict. The country has the world’s most sophisticated weaponry. Israel has definite psychological and strategic advantages over its neighbors and rivals. China has been in a peaceful environment for a long time, and has no advantage over the United States and Japan, in either military experience or weaponry. Many people believe that Israel is backed by the United States. In fact, the Israelis and the Americans also have a competitive relationship, but the common interests of both sides are much greater than their differences. As a result, the United States provides Israel with its latest weaponry, while Israel also applies its capacity for innovation in science and technology to transform or manufacture new weapons. These two trends, one domestic, one foreign policy-related, provide explanations for the powerful Israeli military. In the 65 years since its establishment, Israel has waged five wars with countries in the Middle East. Israel also has experience fighting terrorists with live ammunition. In addition, Israel’s requirement that all citizens serve in the military provides a national level of combat awareness. Given this, it’s difficult to find a real rival for Israel in the Middle East. China, on the other hand, has had almost no wars in the 30 years since beginning its “reform and opening up” policy. China has rapidly developed military weaponry in the past dozen years. However, compared to the military equipment of the United States and Japan, there is still room for improvement. One reason that China cannot declare war easily is simply that it has little or no strategic advantage over the United States and Japan. Dai ​​Xu said that China should set a limit for the Japanese armed forces, to make sure Japan’s military remains a self-defense force. Although correct in theory, it would be difficult for China to put this idea into practice. In spite of numerous Israeli victories in war, the security environment of the country is still grim. This shows that having a strong deterrent force is a double-edged sword. Besides learning from Israel’s tough military attitudes, perhaps China should think more about deft political moves and potential economic costs. The ultimate lesson for China comes from Sun Tzu — “the highest form of generalship is to balk the enemy’s plans.” In other words, the best generals are those that never have to fight.